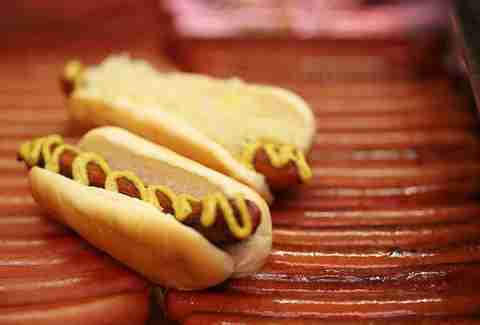 According to the National Hot Dog and Sausage Council (yep, that’s a real thing), New York consumes the second most sausage rockets of any city in the country (LA is number one). 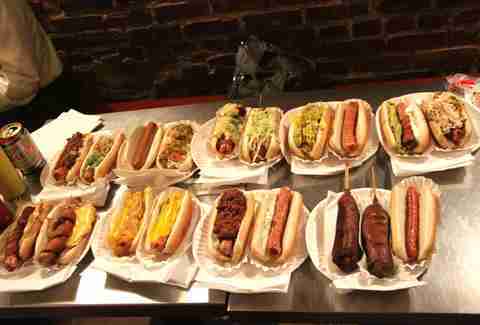 To celebrate us being better than Chicago at yet another thing, we’ve gathered NYC's best dogs, and separated them into out-of-the-box dogs and traditionals. Two reasons we love The Cannibal? 1) The epic amounts of meat (think country ham, freshly made sausages, whole lamb's heads, and cured meats), and 2) the larger-than-life European and domestic beer list. 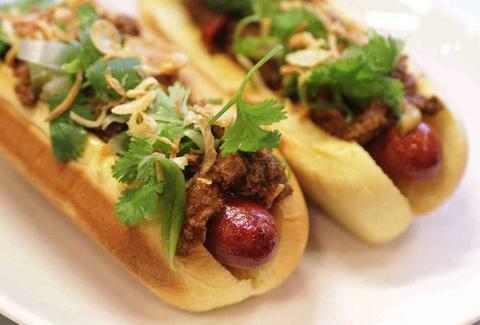 Take a step into that deep meat pool with the Cannibal Dogs, which get topped with tripe and short rib ragu, and are finished with cilantro, scallion, and Asian mustard. What’s more American than eating a hot dog? Eating a hot dog covered with creamy mac & cheese while riding a motorcycle that’s shaped like a T-Rex, and wearing nothing but an American flag tank, on your way to a moonshining -- wait what? Oh right. Get this hot dog. 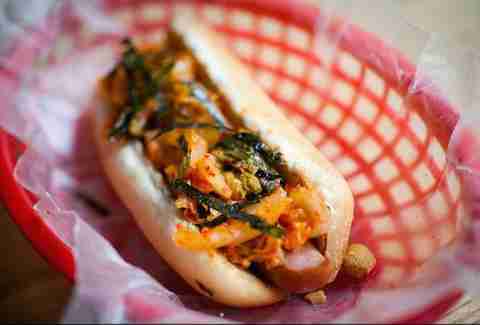 Want some kimchi and seaweed flakes with that frank? How about Japanese curry with homemade kimchi apples? Or Chinese BBQ pork belly? This is the Asian-American joint for you, then -- it's hawking all of those and more, including the must-get Vietnamese banh mi sprinkled with aioli, pate, cucumbers, pickled carrots & daikon, cilantro, and jalapeño. 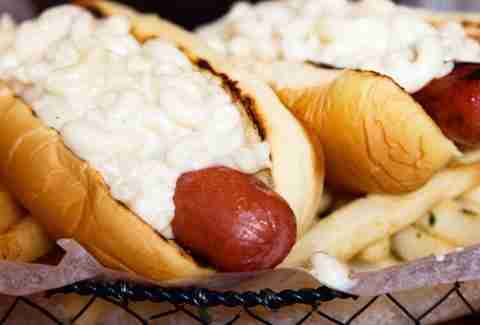 This urban, Fort Greene roadhouse combines two of our nation’s favorite eats -- BBQ and hot dogs. The menu says it all, too: “If you’re going to have a hot dog, you might as well have the best hot dog in Brooklyn, and then you might as well top it with pulled pork, beef, or chicken.” Everything’s bigger in Texas -- and Brooklyn, apparently. Anything goes at Brian Shebairo and Chris Antista’s tiny East Village, Brooklyn, and West Village spots. Options include the Chihuahua (a bacon-wrapped wiener covered with avocado and sour cream), the Jon-Jon Deragon (finished with a schmear of cream cheese, scallions, and everything bagel seeds), the breakfast-ready Good Morning (which comes wrapped in bacon and smothered in melted cheese and a fried egg), and our favorite, the Tsunami (with more bacon, teriyaki, pineapple, and green onions). We just used bacon three times in one sentence. Our pick, The Iraqui (topped with potato chips, eggs, pineapple sauce, ketchup, mayo, and cheese), is the move here, but you can't go wrong with the Perro en Salsa Mora, either (with cheese, crushed chips, blackberry, and pineapple sauce). Both are worth a trip here. Trust. 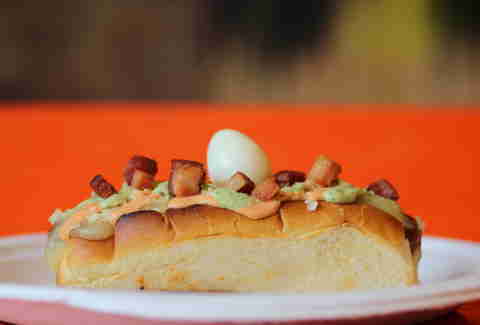 Los Perros Locos literally translates to “the crazy dogs”, and this LES restaurant offers just that. Try the crazy-good Pablo Escobar, loaded with salsa, apple-chipotle slaw, potato chips, mayo, and a dusting of “Perico” (a popular scrambled eggs-focused Venezuelan/Colombian dish). Though, the El Perro Perdido (with a deep-fried French toast bun, strawberry Ancho jam, smoked ham, and melted Swiss) and the Chimi-Churi-Chori (with chorizo, provoleta, homemade chimichurri, aji panca aioli, and crushed potato chips) are also solid picks. We guess. We might be cheating a little with this one, but you're not the boss of us, and well, this is too delicious to leave off. 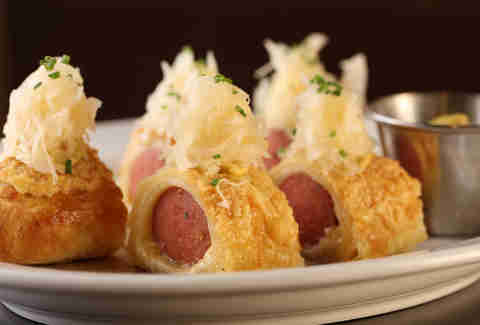 It's the next-level Kobe pig in a blanket, which comes cocooned in a puff pastry and paired with spicy mustard. Taking the egg roll to its next logical step (soooo... stuffed with a hot dog), this Chinese joint in Midtown is serving theirs deep-fried and with duck sauce for dipping. Your move moo-shu. 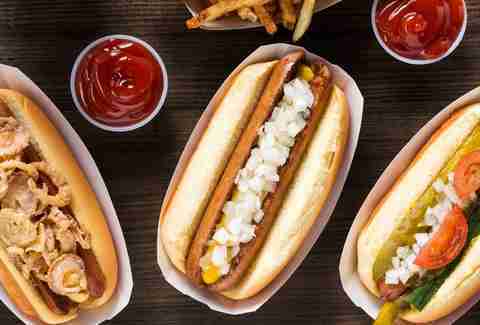 Shake Shack may be a burger-and-shake institution now, but did you know it got its start as a hot dog cart? Well, the next time you’re waiting in line, plan on going tubular with the Shack-cago Dog, topped with relish, onion, cucumber, pickle, tomato, salt & pepper. If you know what’s good for you, head to this century-old joint known more for its pastrami and orgasms than for its dogs. But it’s also where Bill Clinton was said to have once taken down two of its excellent classic hot dogs (in addition to a pastrami sandwich, two knishes, and a side of French fries. CHALLENGE ACCEPTED, BILL.). New Yorkers have been inhaling hot dogs here since 1932, and the loud neon signs tout things like the franks are “tastier than filet mignon”. You be the judge, but hickory-smoked hot dogs seasoned with garlic/oregano and topped with the usual (onions, relish) sure do make a good case. A little bit New York, a little bit Montreal, this atypical Jewish deli uses Pat LaFrieda brisket to make its all-beef Hoyt Dog, which is smoked behind the counter, grilled, and served on a house-made potato bun with kraut and relish. 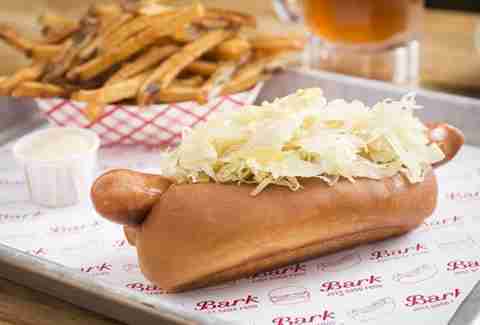 This all-beef frank with kraut, onions, and relish is a superb option while taking in the harbor and Brooklyn Bridge views at this South Street spot. Westville’s naturally raised beef frank -- known as the Niman Ranch Fearless Frank -- is borderline healthy on its own, so you're gonna want to fix that by topping it off with some chili, cheese, grilled onions, and/or kraut. Go ahead, you've earned it. Pour one out for the Gray’s in Greenwich Village (we’ll miss you, old friend). 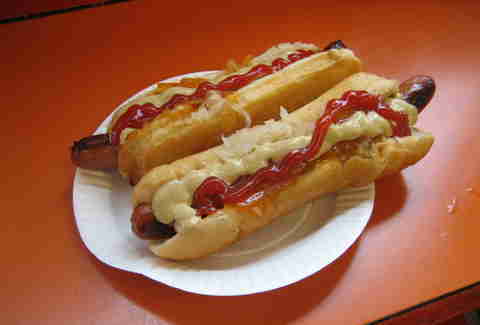 Thankfully, though, the Broadway location is still slinging its franks with offerings like the Recession Special (two hot dogs and a soda for next-to-nothing prices). 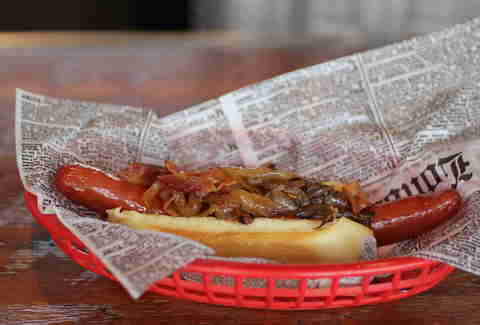 Carnivores will find a winner here with the chili-cheese dogs, the bacon-cheddar frank, or our move: the NYC dog, a classic-style topped with NYC "street cart" onions and mustard. Alisha Prakash is a contributing writer for Thrillist NYC, and she believes if all else fails, hit up a hot dog cart for a dirty water dog. Follow her on her website and Twitter.